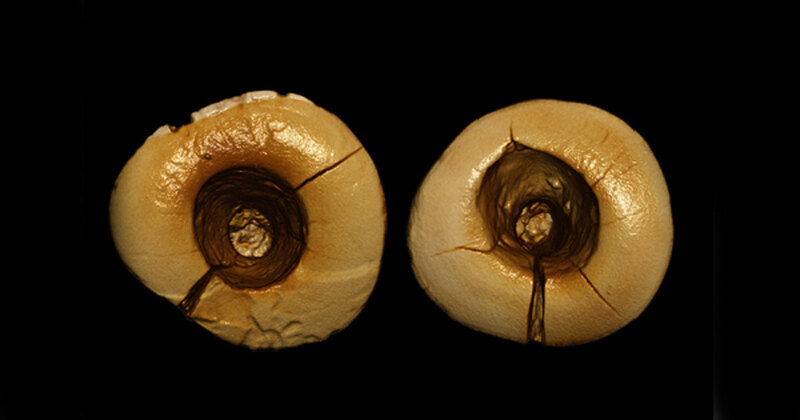 Researchers have discovered the world's most ancient dental fillings in northern Italy. The fillings were spotted inside a pair of 13,000-year-old front teeth and they were made of bitumen, a semi-solid form of petroleum. This is the earliest example of dentistry known to date. The newly-discovered teeth, two upper central incisors appear to belong to the same person and were found at the Riparo Fredian site near Lucca in northern Italy. The results of the research were published in the American Journal of Physical Anthropology , and show that each tooth has a large hole in the incisor surface that extends down into the pulp chamber deep in the tooth. “It is quite unusual, not something you see in normal teeth,” Stephano Benazzi told New Scientist , an archaeologist at the University of Bologna. These holes have tiny horizontal marks that suggest they were drilled out and it appears that bitumen or bitumen was added to the cavity at the same time as the drilling. Researchers also found plant fibers and hair trapped in the bitumen, which may have been part of the filling material. An image showing a known method of drilling a tooth in ancient times. A bow and flint-tipped drill was used to bore through molar teeth found at a Neolithic graveyard in Mehrgarh, Pakistan. According to Benazzi, the fillings most likely served the same purpose they do today: to reduce pain and keep food out of the cavities. Archaeologists estimate the bitumen and plant matter filler was chosen for its antiseptic qualities; used to prevent infection. Claudio Tuniz, an archaeologist at the University of Wollongong in Australia, says that bitumen, as well as some medicinal plants, were possibly used as an antiseptic, just like beeswax was used in other examples of prehistoric dentistry thousands of years later. Tuniz claims that these teeth highlight that humans had achieved healing dental practices thousands of years before we developed the systematic production of foods such as cereals and honey, which are believed to have been accountable for an impressive growth in dental issues like cavities. According to Benazzi, during the Upper Paleolithic, when the owner of the newly found teeth was alive, Europe was experiencing immense cultural changes, as new people kept coming to the continent from the near East. He speculates that they probably brought with them new kinds of food as well, which led to more cavities, “This change in diet and cavities could have led to dentistry,” he tells New Scientist . Ultimately, Benazzi stated that judging by the amount of wear, the owner of the teeth was not very young, even though he can’t make any solid conclusions with the only samples being two teeth. Until now, The oldest evidence of a dental filling was the discovery in 2012 in Slovenia when a 6,500-year-old jawbone demonstrated that a cavity deep enough to impact the dentin layer of the tooth had been packed with beeswax. Scientists aren’t sure how effective this was, but it probably reduced the pain and swelling. The ancient Egyptians are also known to have used a special concoction to treat cavities. The Edwin Smith Papyrus, written in the 17th century BC but which may reflect previous manuscripts from as early as 3000 BC, includes the treatment of several dental ailments, and the Ebers Papyrus, dating to the 16th century BC, contains eleven recipes which pertain to oral issues. Four of these are remedies for loose teeth: the tooth in question is filled with a mixture that is akin to a modern day composite filling: a filler agent (ground barley) is mixed with a liquid matrix (honey) and an antiseptic agent (yellow ochre). This is either used as an actual filling, or as a splint to keep the tooth in place. Scientists performing CT scans on the head of a 2,100-year-old Egyptian mummy also found evidence for cavities being filled with linen, which may have first been dipped in a medicine such as fig juice or cedar oil. The study of ancient remains from around the world has demonstrated the ingenuity that existed in the application of surgical and cosmetic dental practices going back many millennia. or could they have simply chewed on bitumen as a known method of filling holes with the bitumen having some soothing effect unknown to us?